The Galway City Ring road is not the "silver bullet" that will solve the transport challenges facing Galway, but it will "take traffic out of the city", enable public transport improvements, and "reduce the time" workers and visitors spend getting around the city. This is the view of the Minister for Community Development, Natural Resources, and Digital Development, and Fine Gael TD for Galway West, Seán Kyne, who was reacting to Tuesday's announcement by the Government that it had signed off on the €600 million for the N6 Galway Ring Road Scheme, formerly the Galway City Outer Bypass. He described this as "a significant step forward". 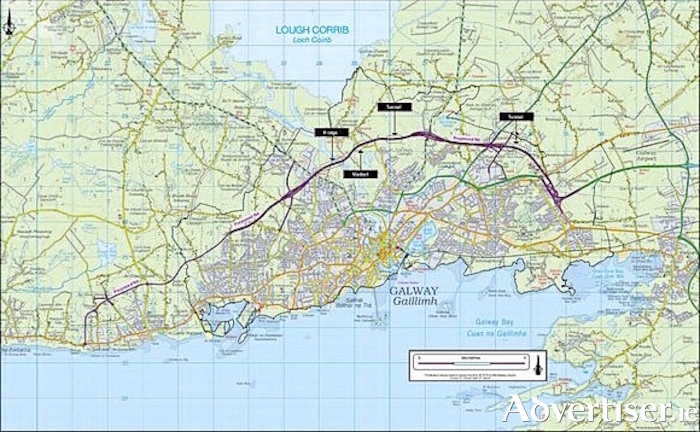 The Cabinet approval allows the Galway City Council to submit plans for the ring road to An Bord Pleanála early next year. This could potentially bring to an end one of the longest running, and most controversial development proposals, ever made for Galway city - one that has fallen foul of EU environmental regulations in the past. Construction of the roadway will involve a new bridge and viaduct over the River Corrib, two tunnels on the east side of the city, the demolition of 44 houses, and CPOs of 10 more houses which would be seriously affected. The affected houses are in Furrymelia near Barna, Letteragh, Bushypark, as well as near the Headford Road and Castlegar. The proposed ring road will be an 18km link between the east and west of the city, beginning as a 6km-long single carriageway west of Barna, continuing via Ballymoneen Road in Knocknacarra to Letteragh. At this point it becomes a 12km dual carriageway, running through NUI Galway's Dangan sports facilities, before crossing the River Corrib 200m south of Menlo Castle. The first tunnel will run for 230m under the candidate Lough Corrib special area of conservation at Lackagh quarry (Coolagh ) on the Headford Road. The second tunnel is north of Galway racecourse at Ballybrit. After this the route links up with the M6 terminus at Coolagh roundabout. The Mayor of Galway, Labour city councillor Niall McNelis, has also welcomed the Cabinet approval for the road. "As it stands," he said, "it can take up to two hours to get across Galway city in heavy traffic. That is nearly as long as it would take you to drive from Dublin to Galway." He also said, that, once completed, it would "allow us to take massive amounts of traffic out of the city", which will result in better traffic flow, and allow City Hall to "finally implement" the Galway Transport Strategy and deliver "better public transport provision". The ring road's bridge over the River Corrib will include two lanes to the west of the city, and four to the east. There are currently four bridge crossings over the Corrib, three of which are in the city. "There are 100,000 crossings made over these bridges on a daily basis," said Mayor McNelis. "This new bridge will make the city more accessible to the west of the county and Connemara." Critics of the proposed ring road, however, argue that the more roads there are, the more cars there will be to fill them, and that a new road, of itself, does not automatically result in less traffic congestion. They also argue that the support for the roadway among council officials and mainstream politicians has come at the expense of, and exclusion of, developing better public transport services and infrastructure. Fine Gael Galway West TD Hildegarde Naughton, while welcoming the green light for the ring road, and calling it "the most significant transport infrastructure project that has ever been proposed for the west", acknowledged these criticisms, and said the Ring Road can only be "part of a solution" to the city’s transport woes, and "not a panacea". "Other independent measures are still required," she said. “We have to bear in mind that it could take up to 10 years for such a major infrastructure project to be completed. We can’t do nothing and wait for such a solution, and there are many measures that need to be pursued in the immediate term." As a result she is calling for the creation of permanent park-and-ride facilities for the west, east, and north of the city; more frequent commuter train service from Oranmore; and more and better cycle lanes as part of an integrated transport system. According to Minister Kyne, “significant work has been completed on the project", including an environmental assessment and consultation with key stakeholders. Public consultation will also take place as part of the planning process. Despite saying he "welcomed all contributions and suggestions to this plan", Minister Kyne said he hoped the objections to be submitted would not see the project "turn into another fiasco, like what we saw with the proposed Apple plant in Athenry". "I think I speak for many people when I say that this project is a necessity for Galway's development," he said. "Our infrastructure needs to be brought into line with other cities such as Limerick and Cork with which we have not been able to keep pace in recent years. If Galway is to compete on a national level for the commercial investment we need to improve our accessibility and our overall transport network." Dep Naughton said that the proposed ring road would facilitate the "properly planned growth and development of the city". She said: “Galway has been driving with the handbrake on in terms of its economic growth and potential for development. The ring road will herald a bright future for commuters, businesses, industry, and for the quality of life of our citizens."